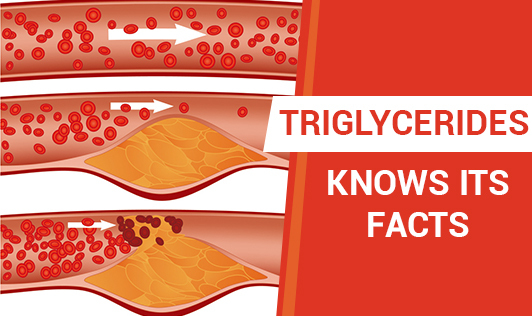 Triglycerides are fatty substances that is found in the blood and stored in the fat cells of your body. It is composed of three molecules of fatty acids combined with glycerol. The excess calorie in the body that is not used up immediately is stored in the fatty tissues as triglycerides. When the body requires energy in between meals, hormones release triglycerides from the fat tissues to meet the requirements. •Hardening of arteries: This leads to heart disease and stroke. •Fatty liver disease: High triglycerides lead to more fat cells in the body can lead to liver complications. •Xanthoma: Excess triglycerides spark the eruption of itchy, pimple-like xanthomas on the hands, feet, arms, legs, and buttocks. •Food habits: Eating fatty meals and refined products like pasta, white bread, and maida (refined flour) products. •Medical problems: Diabetes, hypothyroidism, and kidney disease. •Medications: Certain medications contribute to high triglyceride build up. •Hormonal imbalance: Over production of cortisol and aldosterone. •Smoking/alcohol: Both smoking and excess alcohol intake leads to excess triglycerides. •Sedentary lifestyle: Leading a sedentary life style without any physical activity. •Obesity: As mentioned before, excess calories leads to it being stored as fat, forming triglycerides. •Hereditary: Familial hypertriglyceridemia, familial hypercholesterolemia. •Choose the right fat: Avoid red meat, butter, ghee, margarine. Avoid trans-fats that are present in fried fast foods like fries and wedges. •Choose the right carbs: Choose complex carbohydrates like whole wheat flour, brown bread, broken wheat, oats, and brown rice. •Fruits and veggies: Having plenty of fruits and veggies can never go wrong. These provide fibers, both soluble and insoluble, that helps with controlling weight, thereby bringing down triglyceride levels. Time is a healer, they say. Lack of time is a killer! Take care of your heart!